Haiti Medical Missions of Memphis (HMMoM) is a group of dedicated medical professionals, including physicians, dentists, nurses, pharmaceutical representatives and other medical and health care support staff. The group represents a broad section of the health care industry and is affiliated with several local Memphis-area hospitals and medical centers. The organization began in 1997 as a parish ministries outreach program for the Church of the Holy Spirit Catholic church in Memphis, Tennessee. 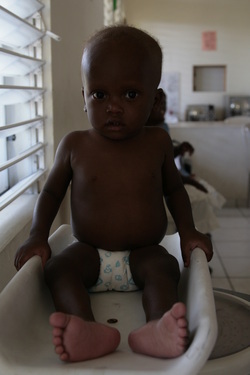 The church had already been providing financial support and supplies to a small Haitian hospital in the town of Pilate. At the time Patrick Moynihan, a former parishioner of Holy Spirit, had been named director of Ecole L'Ouverture Cleary, a school for economically under-privileged Haitian children funded and managed by The Haitian Project, Inc. The school is located in the city of Croix des Bouquets, just outside of Port au Prince. In response to Mr. Moynihan's request, it was decided that a medical team would go to Haiti in April, 1997 to provide medical care to the students and local community. The first team included 12 members who spent a week in Haiti attending to patients at L'Ouverture school, as well as at facilities established by the Missionary Sisters of Mother Theresa, and other temporary makeshift sites. Subsequent medical trips were conducted annually in 1998, 1999, and 2000. Several students from the school served as interpreters and assistants for the medical team. In 1999, we initiated the first annual 24 Hour Tour d'Esprit, our running event fundraiser in support of the project. The event takes place in Memphis each Fall and has been largely responsible for financially supporting the project. In 2000, co-founders Genie Ashworth and Gordon Kraus traveled to Haiti to find and purchase land on which to build a permanent clinic. While there they met Father Joseph Durante, a Scalabrini missionary priest from Italy who offered to build a clinic and residence on the grounds of Saint Charles Borromeo Seminary. This was the first of several Fr. Joe milestones in the success of Holy Spirit Clinic, as well as the beginning of a wonderful relationship. Fr. Joe connected with the Dominican Sisters of Presentation and Chilean based America Solidaria who provided initial staffing for the clinic. Sr. Luz Marina Villada, RN from Colombia, S.A. served as administrator and medical director for the first 9 years. Physicians, nurses and dentists from Chile provided care during the early years of operation. The clinic has been open year-round since. After the opening of our permanent clinic in 2001, mission trips have been scheduled more frequently, with both medical and non medical teams. Non medical team members have included design, engineering, electrical and construction professionals from the Memphis area and elsewhere. During the trip in early 2002, we installed a 40KW generator and an X-ray unit. We later developed a dental room with restorative care and an eye surgical suite for cataract procedures. There is fresh clean water and reliable energy utilizing solar power, and generators when needed, as well as internet access. Our compound, like the country was dramatically changed by the earthquake in January, 2010, and subsequent Cholera outbreak. All of clinics have been and are open 5 days per week treating hundreds of patients daily totally free of charge. Haiti Medical Missions of Memphis now employs a 25 member staff of which two thirds are Haitian. We now collaborate with several other NGO's. After the earthquake we implemented Physical and Occupational therapy with a fully equipped gymnasium and professional staff. Community programs have been put in place as well. At the present time our programs include the primary medical clinic providing adult and pediatric services with very effective hypertension and diabetes care, the eye clinic, the dental clinic, a dedicated cholera treatment center, and PT/OT rehab. We also administer vaccinations, provide nutritional support and basic community health education. Other projects on the compound include the St. Charles Seminary, an elementary school, and the Catholic Bishops retreat center, all created by and under the directional jurisdiction of Fr. Joseph. We welcome visiting teams and individuals who wish to support our efforts in providing quality compassionate medical care. We encourage longer term commitments and guarantee the experience to be enriching and rewarding physically, emotionally and spiritually.